A regular breeding resident in northeastern and north-central Minnesota; a regular migrant and occasionally found during the winter months near open water in east-central and southeastern Minnesota. The Winter Wren was a common species during the Minnesota Breeding Bird Atlas (MNBBA). The Winter Wren is a complex species with a global distribution. Using vocalizations and genetic analyses, in 2010 the American Ornithologists’ Union split the Winter Wren into three species: the Pacific Wren (Troglodytes pacificus), the Eurasian Wren (T. troglodytes), and the Winter Wren (T. hiemalis). The latter is found in the northern regions of Minnesota. Troglodytes hiemalis is largely confined to the northern boreal forest, stretching from northeastern British Columbia, east to the Maritime Provinces, and south across the northern Great Lakes states to New England. It is found also from southern New England southwest through New York and Pennsylvania, and along the Appalachian ridge, where it is a year-round resident. The highest breeding densities can be found in a narrow band of northern forests that stretches from the Great Lakes region east to New England and the Maritime Provinces (Figure 1). Assigned a Continental Concern Score of 8/20 by Partners in Flight and designated a Species in Greatest Conservation Need by the Minnesota Department of Natural Resources. A short-distance migrant in the northern regions. Winters are spent in the central and southern states of the eastern United States. Insectivore that gleans insects, spiders, and other arthropods from the foliage of the lower forest canopy and probes the forest litter layer. A domed nest placed within a natural cavity close to the ground (within 1–2 m); frequently located within the roots of upturned trees, under logs, within brush piles, or in rotten tree stumps or snags. Breeding distribution and relative abundance of the Winter Wren in North America based on the federal Breeding Bird Survey, 2011–2015 (Sauer et al. 2017). We found it particularly common in the evergreen forests on the lower Cascade yet it is found over the entire region wherever heavy timber occurs and in the big swamps of spruce and white cedar, but we never found it in the more open second-growth. Despite its occurrence throughout the northeastern region, breeding evidence was available from only 4 localities: Cook County (young nearly full-fledged), Itasca County (pair with young out of the nest), Lake of the Woods County (nest in brush pile), and Cass Lake (young with parents). Forty years later, Green and Janssen (1975) reported the species was a resident primarily in north-central and northeastern Minnesota and was even common in Itasca State Park. Occasionally reported in Pine and Mille Lacs Counties, there were 2 summer records even farther south, in Anoka and Washington Counties. When Janssen (1987) published another updated account, there were additional records south of the species’ primary breeding range in Goodhue, Hennepin, and Houston Counties, as well as a report of a family group seen near the town of Franconia in Chisago County. Together the records suggested the birds might be breeding occasionally in east-central Minnesota and farther south along the Mississippi River valley. Janssen included a distribution map that delineated 8 counties where nesting had been confirmed since 1970: Aitkin, Cass, Chisago, Clearwater, Cook, Crow Wing, Lake, and St. Louis. Hertzel and Janssen (1998) later deleted Clearwater County from the list and added Itasca County. The Minnesota Biological Survey (MBS) reported an even broader distribution of Winter Wrens in the state. As of 2014, a total of 714 breeding season locations were documented. Although the MBS’s work had yet to be completed in north-central Minnesota, surveys in southern Minnesota were completed many years ago and documented records in Fillmore, Houston, and Winona Counties in the southeast, in Nicollet and Redwood Counties along the Minnesota River, and in Scott, Washington, and Chisago Counties in east-central Minnesota. Field staff also documented several breeding season locations in the Tallgrass Aspen Parklands Province of northwestern Minnesota, and along the prairie-forest border of Mahnomen, Becker, and Otter Tail Counties (Minnesota Department of Natural Resources 2016). During the MNBBA, participants reported 1,837 Winter Wren records from 16.6% (786/4,741) of the surveyed atlas blocks and from 18.6% (434/2,337) of the priority blocks. Breeding evidence was reported in 21 blocks (Figures 2 and 3; Table 1). Reported from 18 of Minnesota’s 87 counties, all but 8 records were restricted to the Laurentian Mixed Forest Province; no records were reported south of Morrison County in the central region of the state and Pine County in the east-central region. Several records were reported from the Tallgrass Aspen Parklands Province as well. Firmly established in the northern forest region, the species’ status farther south is less clear. During the breeding season, the Winter Wren’s song is unmistakable, so it is unlikely that their presence in southern Minnesota was entirely missed by atlas participants. Nevertheless, during the 5-year atlas period, there were 3 independent reports of Winter Wrens outside of their primary breeding range. The first was in June 2010, when an adult carrying food was reported in Douglas County (Kessen et al. 2011). The second was a report from Fillmore County during the summer of 2011 (Kessen and Svingen 2012), and the third was a report from Steele County during the summer of 2013 (Kessen and Svingen 2014). Locational data were insufficient to assign any of the records to an atlas block. The MNBBA predicted distribution map emphasizes the core of the species breeding range occurs in the far northeastern counties of Cook, Lake, and St. Louis, as well as in the adjacent north-central counties of Koochiching and Itasca (Figure 4). Although MNBBA observers reported few Winter Wrens along the southern and western boundaries of the Laurentian Mixed Forest province, the model predicts their occurrence in these regions at albeit lower breeding densities as far south as southern Chisago County and as far west as eastern Kittson County south to eastern Becker County and northeastern Ottertail County. Beyond Minnesota, the species is believed to have expanded its range in southern New England in the late 1900s as mature forest cover increased in response to the abandonment of old farms (Hejl et al. 2002). In neighboring Wisconsin, there appears to be little change in the species’ statewide distribution. Beyond the species primary range in the state’s northern forest region, there have always been scattered populations in remnant conifer stands, rocky ravines, and extensive lowland forests as far south as Milwaukee in the east and Wyalusing State Park, south of Prairie du Chien, in the west (Cutright et al. 2006). Michigan also reports little change in the status and distribution of the species between the early 1900s and the completion of its first atlas (1983–1988). During its second atlas (2002–2008), the southern limit of the wren’s distribution retreated northward by one tier of counties in the Lower Peninsula (Chartier et al. 2013). Ontario, on the other hand, witnessed a 28% increase in the probability of detecting Winter Wrens between its first and second atlas (Cadman et al. 2007). Breeding distribution of the Winter Wren in Minnesota based on the Breeding Bird Atlas (2009 – 2013). Summary statistics of observations by breeding status category for the Winter Wren in Minnesota based on all blocks (each 5 km x 5 km) surveyed during the Breeding Bird Atlas (2009-2013). Summary statistics for the Winter Wren observations by breeding status category for all blocks and priority blocks (each 5 km x 5 km) surveyed during the Minnesota Breeding Bird Atlas (2009-2013). Predicted breeding distribution (pairs per 40 hectares) of the Winter Wren in Minnesota based on habitat, landscape context, and climate data gathered during the Minnesota Breeding Bird Atlas (2009-2013) using the General Linear Modeling method with an adjustment for detectability. The Winter Wren occupies a wide variety of forest cover types. The National Forest Bird Monitoring Program in northern Minnesota and northern Wisconsin demonstrated a strong preference for mixed swamp conifer stands followed by lowland hardwood, black spruce–tamarack, and upland aspen-spruce-fir stands (Figure 5; Niemi et al. 2016). Habitat data collected within 200 m of MNBBA point counts where Winter Wrens were detected showed a strong preference for coniferous bogs and upland conifer stands (Figure 6). Green (1995) classified the species as conifer dependent. Although conifer stands are an important cover type for the species, Pearson (1994) found that mixed deciduous-coniferous stands containing 40% to 70% deciduous cover also were suitable. The birds have even been documented in pole-sized aspen stands (Hanowski and Niemi 1991a, 1991b). A common feature of many sites is the presence of water, either a small stream, lakeshore, or swampy wetland forest. Although the species is most strongly associated with conifer or mixed deciduous-coniferous forests, the Winter Wren’s most important habitat requirement is a dense understory littered with coarse woody debris, including dead logs, slash piles, and upturned roots at the base of fallen trees. Dead stumps and snags also are important. Such features provide foraging opportunities, potential nest sites, and suitable singing perches. A complex and diverse understory is a common feature of mature forest stands. Nevertheless, when slash piles and other debris are present in recent clear-cuts or remain in pole-sized hardwood stands, they too can provide suitable habitat for the species (Hejl et al. 2002; Danz et al. 2007). Typical breeding habitat of the Winter Wren in Minnesota (© Lee A. Pfannmuller). Habitat profile for the Winter Wren based on habitats within 200 m of point counts where the species was present during the Minnesota Breeding Bird Atlas (2009-2013). Statistical analyses using data collected by the federal Breeding Bird Survey (BBS) have generated a global population estimate of 12 million Winter Wrens (Rosenberg et al. 2016). In 2013, Minnesota was estimated to support 1.5% of the continental population (Partners in Flight Science Committee 2013). Applying that estimate to the new continental estimate yields a state population of approximately 180,000 adults. Analyses using MNBBA data generated a significantly higher estimate, of 588,000 adults (95% confidence interval of 527,00 to 703,000 adults). Northeastern Minnesota is the western edge of a broad region across the Great Lakes states, southeastern Canada, and portions of New England where Winter Wrens reach their highest abundance. Across the Boreal Hardwood Transition region and the Boreal Softwood Shield just to the north, an average of 8 to 11 Winter Wrens are detected on BBS routes each year. In Minnesota the statewide average is 3 wrens per route (Sauer et al. 2017). Local breeding densities across the Great Lakes and New England ranged from 2 to 22 pairs per 40 ha in stands as variable as lowland conifers in Ontario to spruce-fir stands in Maine (Hejl et al. 2002). In Minnesota, the NFB Monitoring Program detected an average of 1.4 Winter Wren pairs per 40 ha on the Chippewa National Forest, and 2.11 on the Superior National Forest. On both forests they reached their highest breeding densities in mature swamp conifer stands (3.9 pairs per 40 ha on the Superior, and 4.2 pairs per 40 ha on the Chippewa). They were one of the 20 most common species in 5 of 19 different habitats on the Chippewa National Forest, and in 10 of 19 different habitats on the Superior National Forest (Niemi et al. 2016). In the Agassiz Lowlands Subsection, they also reached their highest abundance in mature tamarack swamp conifer stands (2.5 pairs per 40 ha; Bednar et al. 2016). The species has demonstrated a stable but fluctuating population trend since 1966 across its entire breeding range as well as in Minnesota (Figure 7). At both the national and state level, however, the trend turns dramatically downward in the most recent 10-year reporting period. At the national level the population declined an average of 4.86% per year from 2005 to 2015; in Minnesota it declined an average of 6.32% per year for the same time period (Sauer et al. 2017). This change is corroborated by significant decreasing trends observed on both the Chippewa and Superior National Forests from 1995 to 2016 (Figure 8). The specific factors responsible for the decline are unknown. Harvest levels have decreased on both national forests, resulting in an increase in mature forest stands that should benefit Winter Wrens (Niemi et al. 2016). Many of the microhabitat features the species depends on are characteristic of mature and old-growth forests. The latter, in particular, cover a much smaller percentage of the forest landscape then they did in earlier times. On the other hand, declines in breeding populations are often observed following severe winters or prolonged cold spells (Green 1995; Robbins et al. 1986). These can be a significant hazard for short-distance migrants like the Winter Wren that winter in the southeastern United States. 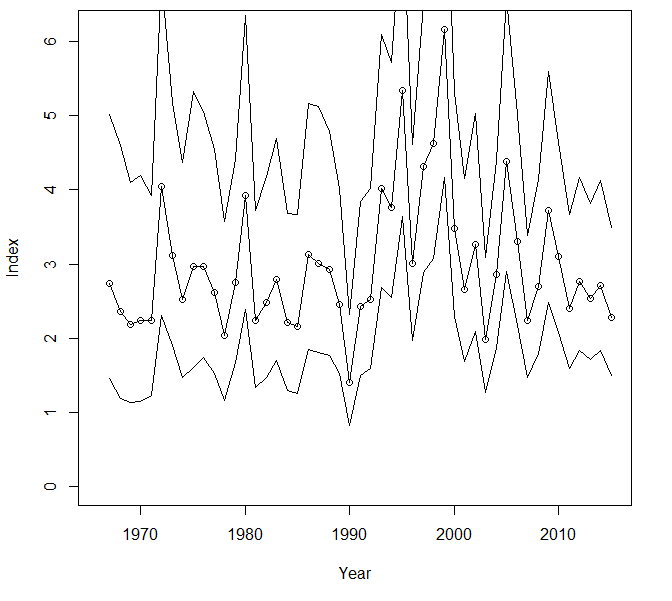 Breeding population trend for the Winter Wren in Minnesota for 1967–2015 based on the federal Breeding Bird Survey (Sauer et al. 2017). 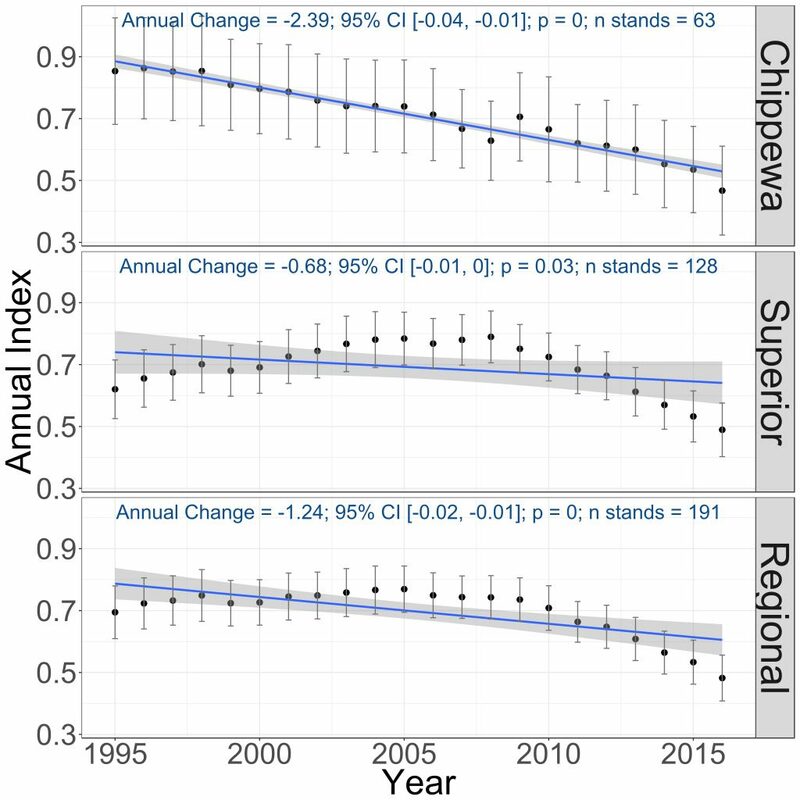 Breeding population trends of the Winter Wren in the Chippewa and Superior National Forests and the combined regional trend, 1995–2016 (Bednar et al. 2016). With relatively stable populations and a breeding range that is largely restricted to the northern boreal forest, the Winter Wren is subject to few immediate conservation threats. It has been assigned a moderately low Continental Concern Score of 8/20 by Partners in Flight (Rosenberg et al. 2016). Nevertheless, in Minnesota concern regarding habitat loss prompted its designation as a Species in Greatest Conservation Need (Minnesota Department of Natural Resources 2015). In the short-term, the Winter Wren’s future appears secure in Minnesota. Forest management practices that ensure the retention of snags and downed and decaying wood help provide additional suitable habitat when stands are harvested. But the future of all northern boreal species, including the most melodious member of all, the Winter Wren, should not be taken for granted. Kessen, Ann E., Peder H. Svingen, and Paul E. Budde. 2011. “The Summer Season: 1 June through July 31 2010.” Loon 83: 10–37. Pearson, Carol Anne Willis. 1994. “Effects of Habitat and Landscape Patterns on Avian Distribution and Abundance in Northeastern Minnesota.” MS thesis, University of Minnesota Duluth.